#2: "Dondake! Konishi Man (どんだけー!小西マン)"
You will watch it, you will be trolled. The OVA is divided into two parts. The one you think it's serious but it's actually troll and the one that is 'ahahaha lol we trolled you'. First part is amazing. Second part is typical Gintama. The art in the first part is sublime. Second part is typical Gintama. The sound in the first part is great (the 5th opening song, Donten). Second part is typical Gintama. You will enjoy it for sure. We Gintama fans are used to being trolled but we still enjoy this troll things. Gintoki's past is something we all want to know and even though this is fake, it's still great. The overall is 10 because of the epicness, the war, the troll, the blood, the Zura, the humor, the troll again, the AHAHAHAHA guy, the troll once more, the Takasugi missing his eye, the troll, the mini Gin-san, the troll, the troll, the troll. 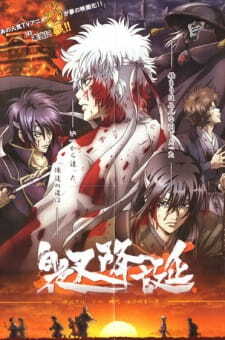 Sunrise recognised the demand for a Gintama movie and so took the concept of a teaser, expanded it a little and made Shiroyasha Koutan for the 2008 Jump Anime Tour event. With only a little information and the runtime to go on, many fans assumed the special would be ten full minutes of action - perhaps a full sequence - set during the Joui war, possibly covering sections of main character Gintoki's past. The end result was completely unexpected, but so in Gintama's nature and an absolute treat for fans. In essence, Shiroyasha Koutan is simply a build up; a supporting act before the main event. The first four minutes are beautifully re-animated backstory sequences from the main series, spliced with additional footage here and there, that have been pieced together to create a trailer for a fictional Gintama movie. Once the trailer is over, we find ourselves in the movie threatre with the main trio, who begin to eliminate the fourth wall in true Gintama fashion by commenting on their own trailer. Before long the supporting cast show up and havoc ensues, then - time's up! It's over. As the characters bid farewell, they reveal the true purpose of the special; to build up the momentum for the One Piece special that follows! Shiroyasha Koutan is a completely unpredictable, absolutely frantic ten minutes, as funny and entertaining as Gintama ever was; positively up to standard. The animation is crisp and feature-worthy and all of the main characters and every member of the prime supporting cast are utulised; not one character is underplayed. It's pure entertainment in true Gintama form; if you're new to the series, it'll most likely go over your head, but if you're already a fan, it'll go straight to your heart. To sum it up simply, the first 3-4 minutes is presented in a serious and somewhat epic manner, revealing a bit of character background and story, along with great quality fighting scenes and of course heartmoving dialogue. The next part is basically the usual gintama humor and gags that is still in high standards, including the appearance of many adored characters of the Anime. A fitting choice of music played during the start of the 'movie trailer' and as expected of Gintama, it sent us off laughing with the One piece and Dondake ending. Of course, it's not subbed yet so only the first part is actually somewhat understandable unless you're fluent in japanese. Never-the-less a great OVA to watch. The Gintama series loves to troll it's viewers with false announcements like it's 'cancellation' and a 'Shinsengumi movie' apart from many other trolls (the biggest of which was a movie of the Benizakura arc which was a reality) and this was no other. Sunrise knows that it's fans want a Gintoki background story and they delivered one... Just kidding. For a 10 minute 'episode' it had lots of intense moments (talking about the actual Shiroyasha part here) and though it was pure troll it still made you feel how an actual show or movie would be if it was a reality. Why an 8? Even in 10 minutes, it still felt like a full fledged episode to some extent. It captured both faces of Gintama perfectly, both the funny and also the serious. It was pure nonsense, and that's all Gintama is at heart. At a widescreen aspect ratio it totally looked like a movie (as pointed out by Gin-san). Although the 'Shiroyasha' part was short, it fired you up, largely because of the small Donten snippet (coming to that in Sound). The fight scenes were also amazingly designed and choreographed and blew me away. I mean, we got to see Gintoki holding a sword! (Not that piece of wood, but an actual sword) and go beast on those Amanto as well sent chills up my spine. The later part of the anime was the usual Gintama art style, bubbly and colorful as always. Apart from the excellent Donten performed by DOES which gave you goosebumps in excitement and the classic background music everyone was familiar in Gintama with also made you laugh not to mention another brilliant (and troll) performance by the Voice Actors, my favorite was obviously Shinpachi in this episode because he had a lot of lines in this episode (lucky Patsuan). Once again the characters were a joy to watch, thankfully Katsura wasn't on standby this time so we got to see a lot of him as well (much to the chagrin of the Shinsengumi). Apart from him the majority of the cast were featured (including Sarutobi and Madao) and they were decently shown as well (especially for that last bit). Although once again you shouldn't expect Character development from a one-off episode. Although I was bummed at the troll I still loved the idea of a Shiroyasha movie and it was a lot of fun watching the episode along with the One Piece spoof ED and ending selfie by them all. I really wished it was 24 minutes and not 10 but oh well. Shiroyasha Koutan was a sort of bonus to the fans and a jab at them altogether and was basically your everyday Gintama troll. That's what made it so much fun to watch. It hyped you up, then trolled you but ultimately left you satisfied at the end. A very Gintama-like present to the Gintama fans. Definitely worth the watch! P.S: (To the tune of Gintaman) Dondakeee. Dondakeee. Don-don-dondondon, DONDAKE!